The Globe Theatre is not usually associated with the use of props. However many Props and Special Effects were used to enhance the dramatic and visual effects of plays performed at the Globe Theatre. The better the spectacle, the bigger the audiences and the greater the profit - much like the modern theatre we enjoy today. A static location, such as the Globe Theatre, allowed for the storage of props. This was not a practical option for the plays performed by travelling acting troupes at the Inn yards. 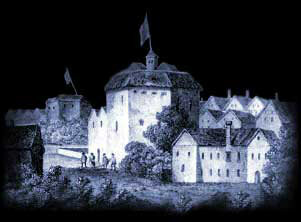 The building of the first Elizabethan Theatres therefore saw the increase in the number of props used. Large Globe Theatre props would have been put into place at the beginning of the play and although it might become unnecessary as the performance went on it would remain on the stage regardless. were habitually left on the stage . . . whatever scenes intervened"
Very large objects that became an obstacle to the actors were probably removed quickly at the earliest opportunity. Canons were introduced as Globe Theatre props. The cannons were situated inside the roof, in the attic above the "Heavens". The cannons were used to create a dramatic special effect such as heralding great entrances especially in the plays which were about an event in history. The cannon was loaded with gunpowder and wadding and this particular Globe Theatre prop led to the fire of 1613 which led to the total destruction of the Globe Theatre within two hours. The Globe Theatre stage had at least three trap doors. The height of the stage was five feet - so the area beneath the stage was easily big enough to hold actors and props. This area underneath the stage was given the title "Hell". Some props could therefore be 'entranced' or 'exited' via the trap doors. The Globe Theatre Heavens was the name given for the false ceiling over the stage. The false ceiling was also designed with trap doors. Through the Heavens trap doors actors, attached by a harness with wires or ropes, could make flying entrances on to the stage and props could be lowered on to the stage. The Globe Theatre company used a 'prop man' who would be stationed in the 'Tiring House' whose function was to ensure that all props were kept in order. The Prop man would have a list of all the Globe Theatre Props which were to be used in a play, what scene they were required for and which actor/ character would need them. The prop list was glued to a board which hung on one of the Tiring House doors. Interesting Facts and information about the Globe Theatre Props. Additional details, facts and information about the Globe Theatre can be accessed via the Globe Theatre Sitemap.